Our attorney, Ed Rose, sent the San Diego Attorney a new letter that demands she honor the Bill of Rights and enforce the law or close Chicano Park. He also suggested, that if SD City Attorney, Mara Elliot is not willing to enforce the law that she is not qualified for her job and should resign. Chicano Park is a political, La Raza park, where the City uses taxpayers money to promote Chicano ultranationalism and communism. Allegedly a public park, the Bill of Rights has been suspended in the Park. Freedom of speech and freedom of assembly is not allowed for park critics and pro-Americans. This is the second letter to the San Diego City Attorney by our attorney. 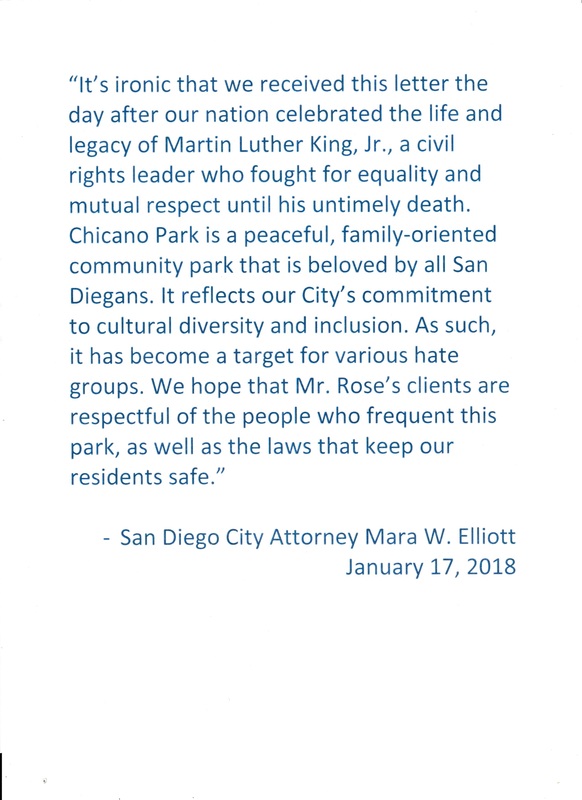 In response to our attorney’s first letter regarding the violation of our civil rights at Chicano Park, the City Attorney, Mara Elliott did not respond directly. Instead she released a purely political statement to the media that implied we are a “hate group” and did not address the legal issues at all.